Revamped inspector, support for the Suunto D5 and other bits and pieces. I finally had enough of the very old dive inspector, and decided to revamp it. That's the main improvement in this update - a brand new inspector. It has a lot more room to display content, making for much less cramped tabs with things jammed everywhere. It is resizable. The site and map are now merged. 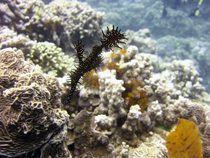 The critters view now shows you the combined critters tagged via photos or directly on a dive. There's a ton of little improvements around the place so I could go on - but really, just download it and have a play. If you run in to any problems then please let me know. This is a fairly big update, there's bound to be a few little kinks to smooth out. There's also support for the new Suunto D5, and I've added Bluetooth support for the Mares Bluelink. Don't forget the usual assortment of random bug fixes, and hopefully that's a decent update. There's a new iOS version out too (1.3.10), available on the App Store now. This has improved Mares Bluelink support (faster and more reliable) along with support for the Suunto D5. I've just released two new versions of MacDive - 2.10.4 for macOS, and 1.3.4 for iOS. Both have been updated to download and visualise decompression information via supported devices - in particular from your Shearwater or OSTC, which have been highly requested. Both work as existing overlays do in that you can toggle the information on/off. The Profile Inspector (or scrubbing your finger on iOS) will show detailed information about your stop times and depths. MacDive for iOS also receives two new utility functions. The first is batch renumbering of dives. 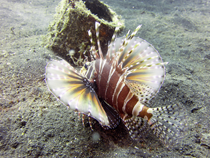 Find this under the Settings menu of any list of dives and renumber away. You'll also find a new option there to export the list to UDDF - you can send this to iCloud or via email. And on that note, the UDDF functionality in MacDive has been overhauled. Both import and export for macOS have been rewritten, so has import on iOS - and the export is new, of course. These are now far more consistent and read (and write) much more information. There is support for some new devices and a few other bits and pieces as well. As usual, check out the full release notes. Not me - MacDive! This update has been a while brewing, and I'm glad to finally get it out. Primarily it is compatible with macOS Mojave, which will be available shortly. I'm a big fan of the new dark mode. The update also contains TouchBar support for your MacBook Pro, a bunch of new device support, and many other bug fixes and improvements. Along with this release, MacDive v1.3.1 for iOS was released yesterday. Both releases contain support for the Shearwater Teric - thanks to those of you who have been testing this for a while. As usual, let me know of any problems! After a very long wait, I'm happy to announce that the latest update of MacDive for iOS has support for the iPad. We've tried to create a more iPad friendly layout while retaining the same look and feel of the iPhone app. Obviously a lot has changed in the app to let things work for both iPhone and iPad where possible, so please let us know of any issues. The Dashboard is the major new addition to the iPad. 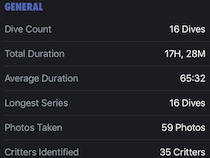 A place to show off your stats, see your recently logged dives for quick access, etc. We're interested to hear feedback on this so we can add to it in future updates. Please let us know what you'd like to see here! As well as the obvious big change, there are the usual bug fixes and improvements. There have been a number of UI tweaks of the iPhone version - everything from fixing lines that were a pixel too large to rewriting bits and pieces from scratch to make them work better. We've also included support for the Mares Bluelink to let you download dives via Bluetooth from supported Mares devices. As with any version of MacDive, we don't really think of it as "finished". Merely a place to start. So, back to it..
A new release for macOS today to push out some new device support and other improvements. 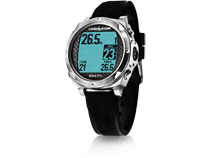 This release contains support for the Scubapro Aladin Sport Matrix, via Bluetooth. This means I've also added Bluetooth support for the Scubapro G2, to complement the existing USB support. A couple of you have asked for this so I hope this makes things more convenient. Support for the Matrix will also be coming to iOS shortly, once the latest update has been approved. This release also adds support for the Garmin Descent Mk1 via FIT file. Drag and drop away! As the Descent has GPS, I've also incorporated a couple of the location-based features from iOS in to macOS. 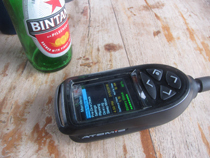 Namely, when you download, the GPS coordinates will be grabbed from the dive. When using a menu to select a site (either from the dives table or the location tab of the dive inspector), you may see an extra entry at the top if an exising site at the dives location was found. Also, the quick-create-site menu in the dive inspector now has GPS fields and they will be pre-populated for you with the location. Not too many exciting features, but I've done a lot of internal work just tidying things up, a few performance improvements and bug fixes, etc. Please let me know if you run in to any issues! The full release notes for macOS are available here. Just a couple of really quick updates to add a feature people have been asking for, and tidy up some very old code. A number of people have been asking for gear group images to be synced and viewable/editable on macOS. I finally sat down to tick that off the list, and at the same time, decided to give the various thumbnail views a lick of paint. A few people have mentioned over the years that the various thumbnail views (Gear, Critters, etc) could be difficult to read. This new update gives them an updated design which is far more readable. At the same time the internals have been tidied up significantly. For one thing, this resolves a couple of "bugs" that have existed since around 2.0.0, in that editing the various details wouldn't trigger the thumbnails to update properly. This should all be fixed - everything should now look, work and feel nicer. As an extra, you can now right-click on any thumbnail to view the associated dives. This update contains a couple of other minor bug fixes, but is mostly just about updating those thumbnail views. I wanted to get it released sooner rather than later, so give it a try and let me know what you think. There's also a new release for iOS. This essentially exists just to fix a bug syncing the gear group images that I found while updating the macOS version. It includes a "Random Dive" button hidden under Stats, which I find myself using all the time just to remember some old dive somewhere or other..
Support has been added for the Scubapro G2 to macOS 2.9.1 (USB) and iOS 1.2.9 (Bluetooth), both available now as free updates. This includes support for the optional heartrate monitor. MacDive for macOS now includes a BPM overlay on your profile graph if you used one on your dives, which you can toggle on or off, and you can view your heart rate per-sample when you inspect the dive profile. The iOS version now has the ability to filter critters in both the main critters view and also when identifying critters. Hopefully this helps speed up tagging what you've spotted. You can also choose to sort smart logs by their saved desktop order, rather than just by their name. The toolbar has had a little bit of love on macOS and sees some new icons and a bit of rearranging to hopefully make common operations more accessible. The gear and certification thumbnail views have also seen a large performance improvement - hooray for obscure bugs that have existed for many years and were finally tracked down. Both new updates also contain an assortment of bug fixes to everything from UI quirks to downloading dives. The full release notes for macOS are available here. As usual, let me know if you run in to any issues! MacDive 2.9.0 for macOS is available now! This release has very few noticeable features - some minor bug fixes and UI tweaks and the like. Primarily, this version means that for the majority of devices a USB driver is no longer required. The devices page has been updated to reflect the changes. Along with that, a number of other internal improvements have been made. Ideally you simply won't notice anything, however, it is a major internal update. The changes have been tested by a number of users, and I've tested all of the devices I have physical access to. Of course if you run in to any issues then please drop me an email! If you've given the latest beta a try then thanks very much for your help and feedback, it is much appreciated. 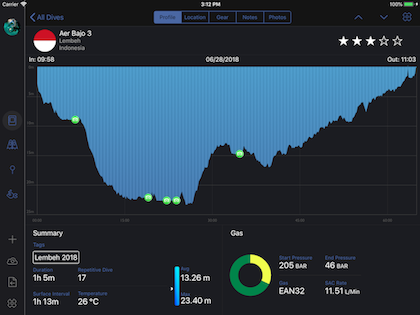 MacDive 2.8.5 (macOS) and 1.2.7 (iOS) available now, with a new Compact view mode, support for the Suunto EON Core, and more. There have been a couple of updates that I haven't posted news about over the last few months, I've been a little slack. Sorry about that! Today I've released another couple of updates with the usual assorted fixes, tweaks and features, and finally gotten around to posting. One feature I've been wanting to add to the iOS app for a while is a "Compact" mode to let you fit more Tags on the screen. It's been requested by a bunch of people, and I finally decided to sit down and jam it out. I've also enabled it for both Gear and Critters, and it can be toggled independently for each so you can configure things to your preference. One interesting (or annoying, depending on how you look at it) "feature" of MacDive has been how it handles flags. We've always wanted this to Just Work, and to have a nice consistent set of images with retina support. Of course, there are cases where a flag is missing or doesn't match how you've recorded it. As anyone who has asked will know, it's an easy update for us to include new ones. But one thing that was never supported was translating countries from your native language back to English, to try and match the bundled flags. Well, both the new macOS and iOS versions of MacDive will now handle this for you. I know of one user who went to fairly extreme lengths to make them show, and this should now work automatically. If you run in to any problems with missing flags then please let me know! And of course, it's always easy for us to add more. Drop us a line! 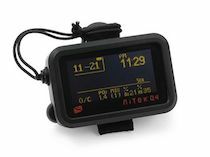 MacDive 2.8.5 for macOS gets support for the new Suunto EON Core. The Profile Inspector (for analysing data points on your dive profiles) has been given a bit of attention so it is easier to read (slightly bigger font, better contrast, etc). MacDive 1.2.7 for iOS also includes support for the EON Core via Bluetooth. As well as the updates I've already mentioned for flags, the US State flags are now included. Of course there's Compact mode, and a bunch of fixes to some layout issues introduced recently. As usual, please let us know if you run in to any problems. Safe diving! Are you seeing a crash on startup? If you are seeing a crash on startup, please re-download the latest version (released earlier today) from this link or from the front page. Your license and data are fine, just grab the latest version and everything will be back to normal. So, what's the story? Unfortunately a certificate used to verify that the application is valid expired. This means that macOS will refuse to launch the app. We were unaware of this until it happened. This same thing happened to a number of other developers and applications, and as such, Apple have increased the validity of the certificates for a much longer period of time. The latest version of MacDive is signed with a new one and will not expire for the better part of two decades. It is unfortunate, but thankfully the problem is easily fixed and no data is lost, which is the most important thing. To better news, a new version of MacDive for iPhone, v1.2.0, was also released which contains Bluetooth download support for the Suunto EON Steel, plus numerous small bug fixes. Give it a try and let us know how you get on. Bug fixes and the usual..
MacDive for macOS 2.8.2 has just been released. This contains a number of internal improvements and bug fixes. One of which is for incorrect pressure readings from the Perdix AI. Traditionally we asked users to re-download dives in the case that data wasn't quite right. However we're slowly updating MacDive to be able to fix these things in place so that you don't lose your notes, buddies, critters, all that cool stuff. So if you have dives made with a Perdix AI you should be able to right-click on them and choose "Refresh Selected Dives". If you have any issues with pressure on dives you've previously downloaded, give this a try and let us know how you get on. Any new dives should be fine! There's no new iOS release today. 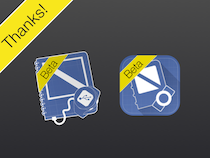 However, there's a new beta in TestFlight with support for downloading from the EON Steel via Bluetooth. Get in touch if you'd like to help test that out, otherwise it should be available relatively soon. If you have any problems autoupdating the current version of MacDive then please try downloading directly from the website. The full release notes are available here for macOS. As usual, let us know if you have any problems, suggestions or comments! I've just released some small maintenance updates. MacDive 2.8.1 for macOS and 1.1.7 for iOS are now available. These primarily fix some bugs I found while I was away diving, a few things that had been reported over the holiday, and a couple of small new features that had been requested. Please note that both the store and the website will be down for (hopefully very!) brief periods of maintenance by their respective providers at some point over the next week or two. The full release notes are available here for macOS. One last update for the year.. The year is rapidly coming to a close. Soon I will be away diving in exotic places, and getting to use my own apps! But before then, we have a couple of updates with some cool features to get out to you. First up is support for the Shearwater Perdix AI. This has been super popular already, so a big thank you to everyone who jumped in and helped beta test. This is available in both the iPhone and macOS versions. Next we have a new option to sync via iCloud, rather than Dropbox. While the sync works pretty much the same way whichever option you choose, iCloud has the advantage of requiring no separate login and also of Push Notifications. What this means is your data will sync and update automatically across your devices that are running MacDive. Obviously this is available on both iPhone and macOS also! Seriously, it is. Otherwise.. it wouldn't sync. Right? Then we have a little love for the iPhone version. We have added an initial Statistics display. When you view any set of dives (All Dives, a tag, dives for a site or a piece of gear, etc) you will see some brief statistics at the top of the list. Tapping that will take you to detailed statistics and graphs much like the macOS version. You can even filter your dives and view the statistics for just those that match. There are, of course, a number of other minor improvements and bug fixes. One of our favourite is that MacDive on macOS will now track the last few devices you've downloaded. If you check the Quick Action menu on the Toolbar, you'll see a list of Recent Devices and you can select one to download. We know a lot of users have multiple computers, and this should hopefully make it quicker and easier when you download from them all regularly. Note that iCloud for macOS requires OS X 10.11 or later. Both versions of MacDive (2.8.0 for macOS and 1.1.5 for iPhone) are available now. Most of this update was driven by my dive buddy harassing me for features that he needed immediately! For example, the ability to import all the sites and critters I had logged, along with photos, automatically. So, you can now import/export Sites and Critters, and the Auto Add feature has been rewritten. It has a more modern UI, it's faster, and it can now auto-tag critters that it finds in your image EXIF data. Along with that there is a number of bug fixes and little improvements here and there. The full release notes are available here . As usual, let me know of any problems. It's update time. We've just released MacDive 1.1.4 for iPhone, and a pretty big update to the Mac version, too. First, iPhone. This is a relatively minor release. Primarily it adds support for recording a Signature from your buddy/divemaster, which a lot of people have been asking for. My favourite feature, though, is that you can now view photos in landscape. Why wasn't this already supported? That's a long story for another time. But, it's there now. On to the desktop. This is a pretty big release. I hope that it has something for everyone and that you enjoy the changes. The highlight is the new Profile. It's the first time it's really changed since way back in the 1.0 days, and it's super cool. A new look. Gone are those ugly little mini graphs for temperature, SAC, pressure and the like. They are now available as overlays and you can toggle them on or off as you like. You can drag and draw selections to analyse portions of the profile. There are a ton of bug fixes, too. Also of note is that the Mac version now has Critters. I know a lot of you have been asking for this, so here you go. 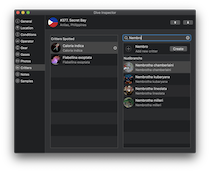 The User Guide has been updated, but the short version is that you can tag critters in the Notes tab of the Dive Inspector, or you can right click on any photo in the Photos tab and identify critters just like the iPhone version. These are definitely the two highlights, but there are a ton more features - too many to list. All the maps have been replaced with Apple Maps. There are a ton of minor visual improvements and performance improvements, a bunch of bug fixes, the Statistics graphs have a new look that is much cleaner, and more. You can check the full release notes here . I'm sure there will be a few issues, as there always is with an update this big. Never fear, we'll get right on it. If you run in to any issues just drop me an email and we'll get things resolved quick as you can gear up and roll off the boat. The User Guide has been updated, but if there's anything else you'd like to see added then get in touch. 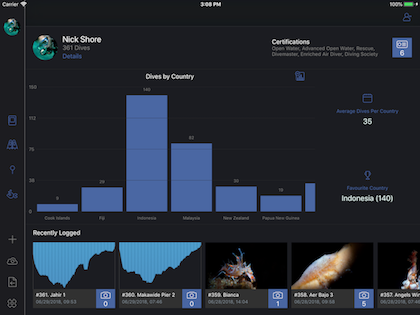 Now available: MacDive 2.6.5 for Mac, and 1.1.3 for iOS. We have a couple of new releases today, primarily a number of bug fixes and minor improvements, and some features people have been asking for. The iOS update brings with it some new devices, the ability to import Suunto DM4 databases, and improvements to the existing UDDF import. There are a number of small features people have been asking for, and the usual bug fixes. The Desktop is similar, mainly a bunch of bug fixes. In particular was the statistics. When you tried to display larger amounts of data, the bar graphs got pretty gnarly. This has been hugely improved, now you can actually visualise the data properly and there were a number of performance improvements along with that. We're still working on some of the bigger features that have been requested, so it's back to work! We've just released MacDive 2.6.4 for Mac, which squashes a couple of annoying bugs and improves compatibility. Unfortunately there's no exciting new features in this release. It's primarily to address compatibility with existing devices, add a few new ones, and improve importing data in general. I'll keep this brief, and get back to work on some more interesting stuff! As usual you can view the full release notes , and thanks for continuing to suggest new ideas and report issues. OSTC Bluetooth, updates for those sunny dive days, and more. Today we have a couple of features people have been asking for. Bluetooth import from the OSTC for your iPhone, and a high contrast mode. We love the dark theme. We really do. But some of you convinced us of the usefulness of having a lighter display style, particularly when it's sunny out. And who doesn't like hanging out in the sun on a boat, waiting for the next dive? So, enjoy! You can switch between the default and light theme under Settings, on MacDive for iPhone. You can also import dives natively via Bluetooth from compatible OSTC's. There are a number of other little improvements and bug fixes, too. 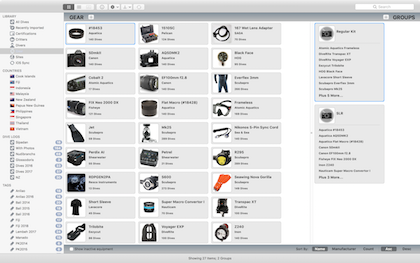 MacDive for Mac gets support for a range of new devices, including the new Aqualung i450t, along with the usual assortment of other improvements. As usual, check out the full release notes for Mac and let us know if you have any problems. Security update for MacDive for Mac. Recently an issue was discovered with the auto update process that MacDive, along with many other Mac apps, use. This release patches the issue for future updates. Obviously you need to update, in order to get the update about updating! While you can use the built in auto-updater as usual, if you have any concerns then you can simply download the latest version of MacDive direct from the main page of this website and replace your existing version manually. It's a small update otherwise. Automerge will now try and copy gas/tank information where possible, so that you can record your air usage to later merge with downloaded profiles. There are a few fixes and improvements for downloading from various devices or reading from various files, and the usual bug fixes for issues that you've been reporting. Keep the feedback coming! We have some larger updates in the works, but we wanted to get this security issue resolved as soon as possible. Major updates to both Mac and iPhone. The response to MacDive for iPhone has been phenomenal, so thank you for the support! We're back with some major updates. The initial release of MacDive for iPhone was very smooth. One horrible crash when encountering certain user data in Smart Logs, and one other very minor crash with service records in some cases. Apologies if you got caught by one of those issues. We did want to keep things a surprise, so we had a little less varied user data than we would have liked. However, all in all, we're pretty happy that there have been very few other bugs. Considering the initial feature set we released and the vast amounts of existing user data that have to be contended with, it was an incredibly stable release and we're pretty happy! One thing that we wanted to improve, however, was the time it takes to sync data. We've made some fairly major changes to how both the Desktop and iPhone versions work behind the scenes. The bad news is that your data will go through an update process when you first launch the new versions, and effectively restart the sync. The good news is that this is now approximately 10x faster. Syncing images is also now significantly faster and should only take a couple of seconds to determine if any changes are necessary. We're pretty happy with that improvement, but there's also a ton of other changes, most of which were added based on your feedback. One of the other main issues that you raised was that photos weren't synced by default on the iPhone. They are now, though you'll be asked to confirm first if you have a large number of them. This release also marks the end of support for OS X Lion (10.7). We do have a custom build of this release available so if you are still running Lion, please drop us an email. The number of users on Lion is now very small, and it's time to move on and make some long overdue improvements. There are also very few users on OS X 10.8, so MacDive now officially requires 10.9+. MacDive is now officially for OS X 10.9 or later. Added the ability to merge manually entered data with downloaded profiles (see the user guide) for more information. Added a tool to batch adjust the date/time of dives. Support for the Divesoft Freedom and Liberty, and the Oceanic F11. A number of performance improvements to various parts of the app. Added support for the Divenav Bluebuddy (including the ability to configure various settings on it). Added a vastly improved New Dive screen. You can now choose either 12 or 24 hour time, and whether to display totals in days or hours. We also opened up TestFlight beta testing for those who are interested. A big thank you to everyone who helped test this release, we really appreciate it. If you're interested in testing out early builds, then please drop us an email and we'll add you to the list. The more the merrier! There is plenty more to come, so stay tuned, and please keep the feedback coming. We're hard at work on even more cool stuff. The full release notes for MacDive 2.6.0 are available here. You asked for Cloud Syncing. We took it one step further. Giving MacDive the ability to sync via the cloud has been the most highly requested feature, so of course we wanted to make it happen. A very close second has been MacDive for iPhone. Once we started on the Cloud, it became obvious that these two "features" should be treated as one. So today, we're excited to announce that both of them are available right now! MacDive 2.5.0 now supports syncing to the cloud with Dropbox and is a free update for all existing users. MacDive for iPhone also supports cloud syncing, and naturally they work great together. Update your MacDive, sync your data, and then go grab the iPhone version! Somehow, I managed to rope a friend in to embarking on this project with me. Jamie was on board from the beginning, although I'm not sure he knew quite what he was getting himself in for. A quiet drink one night followed by a crazy suggestion turned in to a huge project. Jamie was instrumental in creating and designing MacDive for iPhone. He has dedicated a huge amount of time to the App, and it shows in every single screen. Once we had something pretty reasonable up and running it also became apparent that we needed some feedback, a third party to make sure we were on the right track. I'd been speaking to Ken fairly regularly for a while. He was one of the early users of MacDive, and over the years became a friend rather than just a user. When we approached him with what we had he jumped right in to help test it. His feedback, suggestions, testing, and enthusiasm helped transform it in to the app that we have today. I had the pleasure of meeting Ken in Indonesia for some diving recently. Of course, we took this opportunity to fix a couple of bugs under some real world conditions! Both deserve a huge amount of credit, and a massive Thank You. So, Thank You. 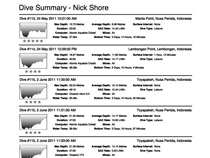 MacDive has grown and evolved over the years based largely on user feedback. It was never considered a "finished" product. MacDive for iPhone is no different. We hope you like the first version, and we hope you'll continue to send us feedback so that we can grow it over time. We have a ton more features planned, so expect some updates shortly. But your feedback is invaluable - let us know what you like, and what you'd love to see. If you have any problems, don't hesitate to get in touch. Email us on support@mac-dive.com . There is a full user guide available to introduce you to the App and all of the new features. We've also updated the existing user guide, so check it out! 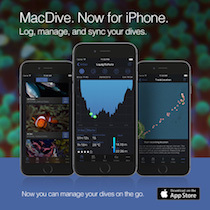 You can grab MacDive for iPhone right now from the App Store. The full release notes for MacDive 2.5.0 are available here. A quick update with some performance improvements and new devices. As I continue to make progress on some major features, here is another maintenance release. There are a couple of new devices (the Aeris/Oceanic F10 and the Heinrichs Weikamp cR), along with a number of internal improvements. The Suunto EON Steel received a firmware update recently and this version not only resolves a couple of minor issues, it also has significantly more robust support for it now and in the future. This release should also resolve the "Unknown Developer" issue. Sorry about that! There are some nice performance improvements and some long standing UI annoyances have been resolved. Please keep the feedback coming, and thanks to everyone who tested the latest beta versions. Along with fixing bugs, we've also made some preemptive strikes against new versions of OS X. Hopefully we'll have a smooth transition, if you're using the public beta of 10.11 then let me know if you run in to any issues! Now with support for the new Suunto EON Steel. These have been in beta testing for a while, but as usual, get in touch if you run in to any issues. A quick update to fix a crash and make things better.. The previous update introduced a crash on OS X 10.6. This has been resolved - apologies for the inconvenience. If you have further problems, please let me know. The update also provides some further Yosemite compatibility to hopefully ensure a smooth transition. A few more bugs crushed and some future proofing. This update contains a few minor features that have been requested, along with support for the Beuchat Voyager 2G. One of the cool little features is the ability to set a default certification. This will get added to all of your dives automatically. Very minor, but it's been requested by a number of people. There are a few other little tweaks, but this is primarily bug fixes and enhanced support for Yosemite. It also contains the usual internal improvements as we work towards some larger features, like cloud syncing. Please bear with us while we get everything finished, and we'll have some very cool stuff to come when it's ready. As usual, let us know if you have any problems! A quick maintenance release with some future proofing, new devices and the usual fixes. This release contains support for two new devices - the Shearwater NERD and the Hollis TX1. There are a number of improvements to downloading from other devices, and a range of bug fixes. Just a quick update this time. There are some fixes to ensure compatibility with future versions of OS X, so please let me know if you run in to any issues. 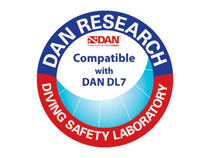 MacDive 2.3.2 allows you to export DAN DL7 data to contribute to diving safety research. It's been a common request, so I'm glad to finally have this available! It took some time to get everything working properly and ensure the data was in the correct format so that DAN can read it effectively. You'll find this option in the Export menu. Along with that, there are the usual bug fixes and improvements. This update contains improved support for both the Cobalt and Cobalt 2. There is support for the Aeris A300, some new statistics, UDDF import improvements and a number of other little tweaks. This release also contains a new list view for managing gear. This enables multi-editing of gear which is hugely convenient, as I found out while I was trying to update my own log. There's also now the ability to create your own bookmarks on your dive profiles. Right click on a profile and you'll see the option to add a bookmark. From there you can edit the bookmark to save custom notes on the dive profile. You can also right click on any existing alarm or bookmark and remove it. The main sidebar can now be configured. MacDive will remember the order of sections if you rearrange them, and there's also a new Preferences pane to allow disabling sections if you don't use them. This includes a new sidebar section that is off by default, for Tags. 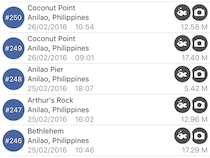 Any Tags you've assigned to dives will have an entry here for quick filtering. Finally, there is also a fix for an issue that was preventing users with very old data from updating. Some files had inadvertently been removed, causing the update to fail. Apologies for any inconvenience there. We're pleased to announce that we will be adding support for the DiveNav Dive Computer Buddy. 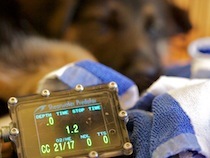 DiveNav's Dive Computer Buddy is a wireless adapter that allows you to download logs from your dive computer. MacDive will be adding native support for the DCBuddy later in the year. We're very pleased to be able to support such innovative products. 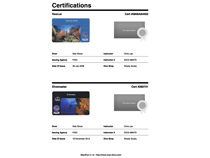 For MacDive users, this will offer a convenient way to download from your dive computer, and also offer access to a few new devices that aren't currently supported. The Kickstarter campaign has been funded, and there's still a few days left to pledge! Get in now and secure your unit. For more information on the DCBuddy and its supported models, please check out the Kickstarter page. MacDive 2.3.1 is now available. 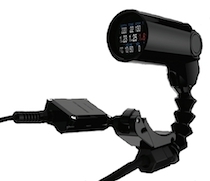 It includes the first Dive Rite device to be supported, the NiTek Q. This is a cool little computer. A number of you have helped with some initial testing, many thanks! Along with that comes support for the Cressi Giotto, and the usual assortment of bug fixes and improvements. A special thank you to Lamar @ Dive Rite for his help! Once again we have a number of behind the scenes upgrades. The most important is that MacDive no longer supports referencing images from external locations. Now, MacDive will take copies of any images that you add. For most of you I hope this will be transparent and make no difference. It means that when you migrate your MacDive data to a new computer, all of your photos will remain. This is something that has never worked very well so I'm glad to have this sorted out. It also paves the way for some of the new features that are coming, so it's an important update. Due to the image upgrades, this update may take some time if you have a lot of photos. There are reports of MacDive seeming to "update" forever. Usually it's finished, but the window never appears. You can resolve this by clicking on MacDive in your Dock, which will magically show the window. I'm looking in to the root cause of this, so if you think it has been updating for a long time please try that. Usually it has finished but the window just hasn't appeared. There are also the usual assortment of bug fixes and improvements, so please do drop me an email if you run in to any issues at all! I've been working away fixing up a number of long standing issues, making some overdue improvements and generally getting back to requests that have been sitting around a while. Hopefully there is something in here for everyone, along with a whole lot more. Behind the scenes there have been a fairly significant number of changes, to all aspects of MacDive. Please, if you run in to any problems, drop me an email. I'm sure I've missed a few things! 2.2.6 Update: Mavericks, the Divesystem iDive range and more. This update fixes some issues people have been seeing on OS X 10.9 Mavericks. Some internal things changed which triggered a problem in parts of MacDive that have been working fine up until now. Apologies for any inconvenience caused. If you have any issues, please download the latest version of MacDive from the website, and the issue should be resolved. If you have any further problems, please get in touch. Now on to some more interesting things. I am very excited to announce that this release contains support for the Divesystem iDive range of computers - the iDive DAN, Free, Pro, Reb and Tech. I've only had the opportunity to do a single dive with mine so far, but it's very cool. If you are lucky enough to have one, then please let me know how you get on! There is now official support for the Oceanic OCi which a number of people have contacted me about. If you haven't already tried out the beta version, then update to this latest release and get downloading. Finally, as far as devices go, there has been a change in how MacDive talks to the Shearwater Petrel. Previously it was using an old backwards compatible method which was the same as the Predator. 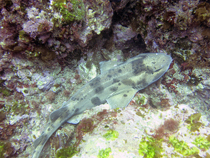 Unfortunately, this only gave access to the most recent dives. As the Petrel has much more memory, this wasn't being taken into account. So this release resolves that problem, providing access to all 1000 hours of dive data that you can store. It also improves the downloading time in cases you're only downloading a few of your latest dives. The caveat to this is that you need to set up your Mac to talk to the Petrel slightly differently. Please visit the help for instructions. It's quite simple, and only required the first time. Things have been very hectic at my day job the last few weeks due to an upcoming deadline, but there's more to come once that settles down! The full release notes are available here . This release, once again, focuses primarily on internal improvements but also provides a few useful features. There is a new option available (by right clicking on a series of selected dives) to renumber them and recalculate their surface intervals/repetitive dive numbers. This makes it easier to sequentially number dives at any point. 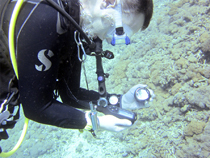 There are also some smarts added to determine dive locations from the GPS information present in photos, if available. Another handy new feature is the ability to print a PDF of all of your gear. There is also support for the Hollis DG02 and the Sherwood Amphos, along with a number of improvements to importing dives from LVD and DM4 files. There are a number of bug fixes and also minor interface improvements, so let me know what you think. I will be heading off on a dive trip shortly, so please let me know of any issues as soon as possible. The full release notes are available here , let me know of any problems. A somewhat boring update with just a few important bug fixes, but lots of internal improvements on the way to some more interesting new features. I'll keep this brief and get back to work! Release notes available here , let me know of any problems. A few new devices and the usual bug fixes. This release contains support for the Genesis React Pro White and the HeinrichsWeikamp OSTC 3. It also contains additional support for a new variant of the Oceanic OC1. Along with those devices, the new Liquivision LVD 3.0 file format is supported. Previously MacDive would import Suunto DM4 XML files for you. This was great to get your old dives in, however you can only export them one at a time from DM4. Which was tedious when you had hundreds of them! So, this release also adds support for reading the DM4 database backup file directly so you can import them all in one go. After the last release a very helpful user contacted me with data from his Mares devices, so thanks to that CNS is now tracked for most Mares devices. There's also the usual bug fixes, along with some internal improvements to facilitate future development. Please note that while LVD 3.0 is supported, I have very little test data. If you have any problems, please drop me an email and send your LVD file through. The release notes are available here , let me know how you get on! After lots of enquiries about the Cressi Leonardo it is now available in MacDive, along with the new Suunto DX, Oceanic Pro Plus 3 and the Mares M2. 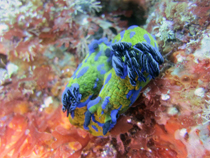 I had the pleasure of diving in Manado, Indonesia earlier this month, including Bunaken Marine Park and the Lembeh Strait. These places are home to some pretty spectacular dives. As a macro fan this is my kind of diving. Of course, when I'm underwater it is hard to reply to email! Thanks all for your patience while I was away - it is very much appreciated. I need to dive too! I hope I've gotten back to everyone now. If you haven't heard from me, please get in touch and remind me. Other than adding support for some new devices, this is a reasonably boring release on the surface (yes, terrible pun intended). I spent quite a bit of time improving performance and fixing bugs behind the scenes, along with a general code tidy up. So while there aren't too many new things to play with, overall it should be more stable for everyone and run a little smoother. The biggest new feature is that MacDive will now track your CNS/OLF % for nitrox dives, if it can be read from the device. Most of the devices I had data from to test support this. If your device doesn't show it, let me know and we can see about adding it. This is displayed in the dive inspector under Gases, and will be available when downloading new dives. This will show you the overall percentage at the end of the dive. As mentioned above, support for the new Suunto DX has been added and from the testing done so far everything looks good. The caveat is that I have no data from any CCR dives, which is somewhat the point of the device. So if you're using it for any CCR diving then please get in touch. Standard Air/Nitrox dives should all download correctly. A big thank you to Ron B for all his help testing this device - cheers! The release notes are available in the usual place , and as always, let me know if you have any problems. Lots of stuff in this update.. 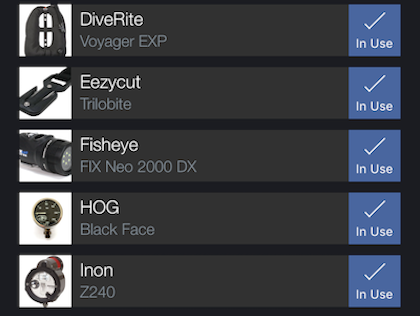 There are a number of new features for CCR divers in this update. Depending on your device, you will now see set point switches on the profile. You can create smart logs based on this info. You'll also get a PPO2 graph, and there is a place to track your scrubber usage, and your supply types. There are of course many more things to be added, but this is a start. A big thanks goes to Christian and Jean-François for their help - thanks guys! Along with a few new devices there are also a number of other improvements. My favourite being the rearranged Dive Inspector. Things are a little tidier and grouped a little more logically now. Something else a lot of people had asked for was the ability to read the MacDive XML format back in. It does, of course, seem rather silly that this wasn't possible before. By way of an explanation, the XML format wasn't really supposed to exist. It was a temporary thing that got left in, and people seemed to actually use it a fair bit. One thing that was a little frustrating was trying to export information and share it with a friend, between copies of MacDive. The XML format seemed like the ideal way to do it, but of course MacDive wouldn't read it back! So it has had a bit of an upgrade to export even more information, tidy a few minor problems up, and most importantly you can now read it back. This makes it easier to share data in a consistent way. There are plenty of other little tweaks, bug fixes and the like so see the release notes for the full list. And of course, let me know if you have any problems! Not quite the vacation we had planned, but some fantastic diving and an awesome trip all around. 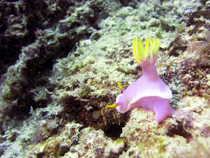 The original plan was to meet a good friend of mine, Karl, in Vanuatu for some diving on the Coolidge, Million Dollar Point, and various other sites around Espiritu Santo. Unfortunately when I landed in Auckland and went to check in to the Air Vanuatu flight, I was told the plane had broken down. I thought perhaps I could jump a quick flight to Sydney and meet Karl there, and then get on the same flight as him to Vanuatu. Of course, it turns out it was the same plane - they only have one! It was going to drop me off, and then head to Sydney and grab him. So after weighing up the various options we decided to dive the Poor Knights instead, and take a credit for the rest of the flights. Turns out this was a pretty good idea, because we had a fantastic few days in Tutukaka diving with Dive! Tutukaka . They are the one of the best dive operators I have had the pleasure of diving with. 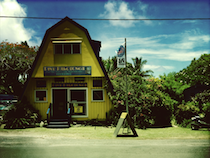 If you are wondering where to book your next dive trip, wonder no longer: stop reading and book in with these guys right now. Awesome diving. Awesome crew. The most detailed site briefings ever. If you're a beginner you will be well looked after, and if you're more advanced then you get awesome briefings and the freedom to dive your own plan. I'm getting caught up with email now, so if you haven't heard from me then give me a reminder. I'm also finishing off a new update that has a bunch of cool new stuff, it should be out shortly. In the meantime, happy diving! A few of these badboys around. The hand signal for these is amusing. Lots of nudis - still looking for Jason though. Summary about a summary - so meta. Here's a new update for you all. A number of people have been asking for the ability to print a Dive Summary - something a bit more concise than the full dive profile that you can currently print. So this is now available (Under File -> Print Summary), and hopefully what you were after. There's an example attached to the post and I'm keen to hear your feedback. The other exciting feature is support for the HeinrichsWeikamp Frog. This is an awesome little computer that downloads via Bluetooth. For those of you lucky enough to own one, please give it a try and let me know how you get on. A couple of other minor features round this out, along with the usual bug fixes and improvements. Enjoy! Release notes available here . Bug fixes and a few little features. I've just released another little update. This one is primarily a maintenance release which offers some speed improvements and bug fixes. But as usual there are a couple of new features. First up is support for the Shearwater Petrel, for those of you who have one. Second - a while back someone on the forum suggested being able to print a copy of all of your certifications. Well, that was a great idea, so now you can! There are a few little tweaks around the place. For instance, you can now select a Tag on any dive and completely remove it from all dives. You can also click through any statistics bar graph to view the dives it represents. On top of that, the General Statistics display got a bit of a design tweak. There are quite a number of behind-the-scenes improvements so let me know if you have any comments or problems. In case you lose them.. There's a new release available, now offering Retina support for those of you with a shiny new MacBook Pro. It has a few fixes for various other Mountain Lion updates, and also includes fullscreen support. Of course there are a few other bits and bobs - support for the Hollis DG03, Oceanic OCS and the Sherwood Wisdom 3. There's a new Buddy Management panel to let you clean up those pesky buddies that mix up the auto-complete. Hopefully one day I'll get around to fleshing that out better, but it's a quick way for you to clean those up for now. Each piece of gear will now show you the total time it has been wet. It also includes the usual bug fixes and improvements under the hood. Please let me know if you have any issues! Full release notes available here . And last, but definitely not least, a huge, huge Thank You to Jamie who slaved away on icons and graphics for this build. You rock, man! And a more refined logo! 2.1.5 is now available, offering support for downloading from your Shearwater Predator. Let me know how you get on! There is also the ability to manage your tags, by removing them, removing all of your unused ones, and also renaming them. You can find this in File -> Manage Tags. As usual you can check out the release notes for the full list of changes. Please let me know if you encounter any issues. This is primarily a bug fix release, and is recommended for all users. It contains fixes to avoid a few crashes. A minor but worthwhile update. 2.1.4 is available now. It's a minor update to resolve problems reported over the last few weeks. Hopefully this fixes the common issues people have been having. Included is the ability to much more easily select sites from the main Dives view. This was starting to get a little out of control when you ended up with multiple sites that had the same name (e.g., House Reef), so hopefully the enhanced selection is of use. As usual you can check out the release notes for the full list of changes. Please let me know if you encounter any issues. This version also contains very preliminary support for the Zeagle N2iTiON3. It is not listed as officially supported, as some manual installation is required in order to make it work. If you are interested in using this device, please contact me via email and we can look at getting you set up to test it. The Oceanic Atom 3.1 is also supported, along with the Dacor Darwin Air. Now, back to working on some exciting new features.. The new patch is out, but work doesn't stop there. 2.1.2 brought with it a few bumps, and 2.1.3 was released pretty quickly to address the major ones. I appreciate your patience - it was a very large update, and a few things slipped through the cracks. One thing that has been a little irritating for quite some time is selecting sites in the main dives table. You had one big list of sites, with only the site name displayed. This got pretty hairy when you had a large number of sites, especially when you had multiple countries and locations with the same site name (for example, House Reef). I've hopefully addressed this for the next update, but I do have a beta available here if you'd like to try it now. It also contains a few other minor bug fixes, and I'll look at releasing a new official update shortly. MacDive 2.1.3 - Out Now! 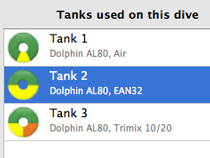 Here's the latest version of MacDive, with support for multiple tanks/gases. This release contains a number of improvements in all areas of MacDive, along with support for some new devices. The Aeris F10 and F10 v2 are now supported, along with the Hollis DG01 and Mares Nemo Apneist. There's also support for the Oceanic VT4.1 and the Suunto Spyder. You can also now import Liquivision Dive Log files. There are some pretty big changes in this version, so please, let me know if you encounter any problems. The gas management is all new and things have changed a bit, but I will be updating the documentation over the next couple of days. Please bear with me, and if you have any trouble then drop me an email. A big thank you also to davef, Jean-Francois, mike and Socke for their time and patience helping to test the new stuff - cheers! Multiple tanks? About time, I hear you say..
As I said in the last post, multiple tanks was next on my list. I've made some good progress on this over the last few days. I'd love a hand testing out this first cut, if anyone is up for it. The interface isn't quite final, but it's functional. And I'm not just looking for people with gas switches and fancy side mounts, either. Anyone who is keen to try it out would be great. There are many changes so the more testing the better, even if you just do boring old air dives with one tank (like me!). Keen? Awesome. Drop me an email! The other thing that would be helpful is anyone out there with a Mares M1, M2 or Airlab, or a Dacor Darwin or Darwin Air. If you have one of these devices, please also drop me an email. And finally, Happy New Year to everyone, and thanks for all your support throughout 2011. I'm back from my trip, and have a little time up my sleeve. How about we get the Aeris F10 supported finally? 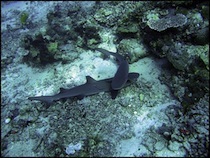 Had a great time with Dive Rarotonga in the Cook Islands - a big thanks to Ed, Karen, Paul and Charles for the dives. If you're heading over that way, go see them! 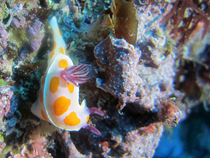 While Rarotonga itself isn't exactly known as a dive destination, the diving there is more than worthwhile if you happen to be in the area. Awesome drop offs, fantastic visibility, warm water, small groups and a great bunch of people to dive with. And now, what a lot of you have been waiting (incredibly patiently) for - support for the Aeris F10! As I have a little time up my sleeve before I head back to the day job, I thought I'd finally get this added in. I'm most of the way there and have a beta available if you would like to give it a shot. Please drop me an email on support@mac-dive.com and I'll send it through. The next thing on my list is multi gas support. If you have a device that has gas switches on it, I would love to get some sample data from you. Particularly a HelO2 with some trimix switches. Drop me an email to the same place! That's about it - enjoy your holidays if you're lucky enough to have some, and as usual let me know if you have any problems, questions, suggestions or beer! I've just released a new update. This is mostly a bug fix release, but contains a few new features. First up we have support for the Mares Icon HD Net Ready. A lot of you have been asking (and testing the beta - thanks!) so I'm glad to have this available finally. Second, a big thanks to Denny who contacted us and donated some of his free time to helping make some fairly large improvements to downloading from certain Oceanic devices (particularly the OC1, Pro Plus 2.1 and VT4). If you have one of these (but also many of the other models), I'd love to hear how you get on. Hopefully there will be a lot less frustration. Just a quick update - more new features coming soon! You can check the release notes at the bottom of the page for the full list of changes. I'm currently preparing a new release, and as part of that it would be great to get a bit of feedback on some new and improved device support. The next release will (hopefully!) be adding support for the Mares Icon HD Net Ready, and also the Dacor Darwin Air. It also improves reliability downloading from certain Oceanic devices, in particular the OC1, Pro Plus 2.1, and VT4. Feel free to give it a try, but please drop me an email and let me know if it worked, if it didn't, or if you have any other questions or comments. 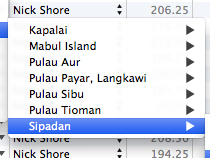 Since I left Singapore, my Macbook Pro has been stuck on Singapore time. Why? Because MacDive 2.0.6 isn't so great with dates and times, and if I change the time then all of my dives are wrong. Of course, I'm far too lazy to fix them all manually! So one of the big things with MacDive 2.1.0 is the long overdue introduction of proper timezone support. 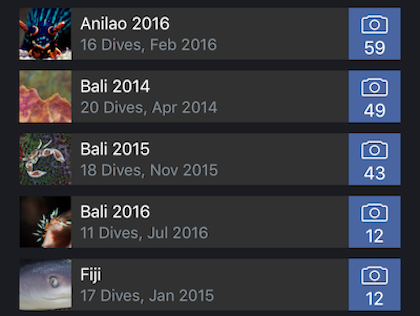 On first launch, MacDive will update all of your dives to include the current timezone your computer is set to. From then on, every time you import you can choose what timezone the dives were done in - whether you've got your laptop with you at your dive destination or if you're downloading them when you get home, things should work again. So now that this patch is out, I can finally update my own dive log. A little ironic? Yeah. I'm also pleased to announce that with the help of Doug Krause at Oceanic, MacDive now supports the new Atom 3.0 and VT4. Doug was kind enough to send me a couple of demo units, and of course they needed to be tested. Please also note that this release drops support for PPC machines. It also no longer officially supports Leopard. That is to say, it may work on Leopard - I'm not sure what kind of problems you'll run in to. It has become increasingly difficult to support both, and they are now no longer officially supported in the development tools. If you're running either a PPC machine or Leopard, then you should not upgrade to 2.1.0. MacDive 2.0.5: Now with 100% more Cobalt. Typically I try to release an update every month or so. I try and get a new feature or two in, and also address any issues people have been having. It's been a few months since I dropped an update, but I'm happy to finally have it available for you. So, why did it take so long? Well, along with a big relocation in the middle there, I've been working with a couple of people on some exciting new stuff. First up, I'm proud to be the first to offer you the ability to download from your shiny new Atomic Aquatics Cobalt ! The people at Atomic have been a real pleasure to work with. They were kind enough to send me a demo unit to aid development, and were only ever an email away when there was questions. It's great to see a manufacturer who wants to support us Mac users! There's also the typical bug fixes and other new features, including a few other new devices. See the release notes for a more detailed list. As usual, let me know if you have any issues at all, especially with the Cobalt.